Snooki wasn't always a star legend as she is now on MTV's hit show The Jersey Shore. Born in Santiago, Chile Snooki whose real name is Nicole Polizzi was adopted by Italian American parents. Snooker got her name in middle school when her friends nicknamed her after the famous character "Snooky" in The Last Dance since she was the first of her friends to kiss a boy. Snooki's life wasn't one without its share of troubles. Growing up in Marlboro, New York Snooki became a cheerleader in high school, which she claims led to her eating disorder. At one point Snooki weighed just 80 lbs. Once Snooki graduated high school, she pursued her studies at the local community college in Marlboro where she studied to become a veterinarian. The biography of Snooki is another story of a rising star who like Kardashian's has taken full advantage of the opportunities coming her way and like you, she's a real person with ups and downs, except her life experiences are in front of the camera and mainstream media broadcast for many to see. 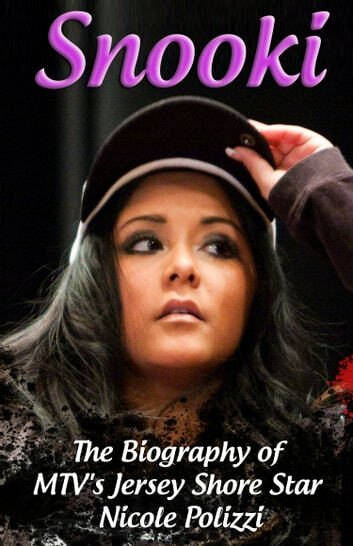 This is a relatively short and concise read about Snooki's past, present and future!